The 29th Annual Meeting of the European Society of Gastrointestinal and Abdominal Radiology (ESGAR) celebrated in Dublin, Ireland, saw the handover of the ESGAR European Radiology Awards. 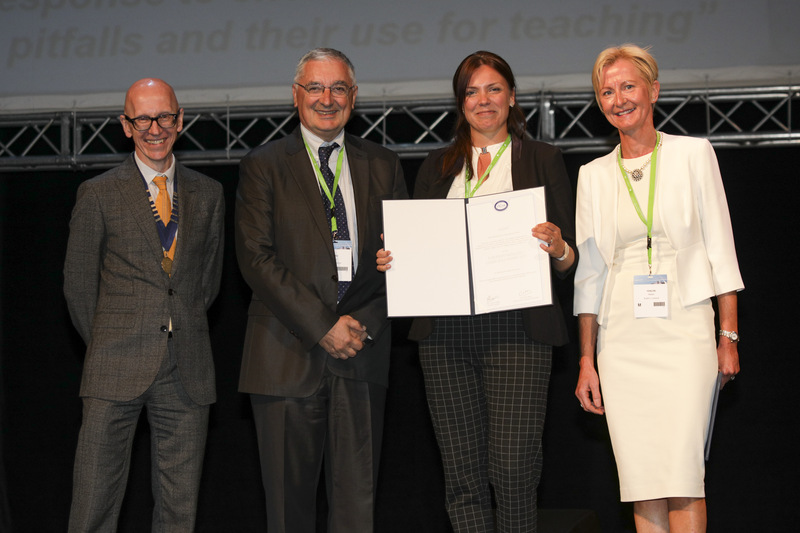 The Gold Award was won by a combined team from Maastricht University Medical Center and The Netherlands Cancer Institute for their paper “Diffusion-weighted MRI to assess response to chemoradiotherapy in rectal cancer: main interpretation pitfalls and their use for teaching”. The photograph of the handover pictures author Doenja Lambregts together with Yves Menu (Editor-in-Chief of European Radiology), Steve Halligan (President of ESGAR) and Helen Fenlon (President of the Annual Meeting). In addition to Prof. Yves Menu, Prof. Steve Halligan and Prof. Helen Fenlon, the jury choosing the best papers to be awarded consisted of Prof. Regina Beets-Tan (President-Elect), Prof. Andrea Laghi (Vice-President and Prof. Marc Zins (Programme Committee Chairman). The jury selected one Gold Award and 3 Silver Awards winners among a total of 29 papers. The 30th Annual ESGAR Meeting will take place from 5 to 8 June 2019 in Rome, Italy.